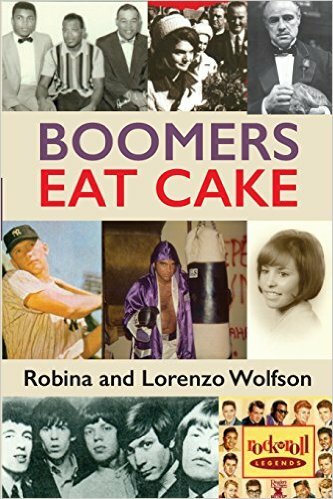 Compiled by Robina and Lorenzo Wolfson, 'Boomers Eat Cake' throws readers into the sport, music and entertainment of the 1950s to the 1970s, and again for the unpredictable modern era. This book-bound blast-from-the-past showcases the quirky world baby boomers contended with, and the insanity they deal with today. One critic recently said, "save your movie money and get this book"! Port Chester, NY – For the seventy-seven million baby boomers living on American soil, life has never been boring; a roaring conveyor belt of ever-changing pop culture, zany trends and a host of colorful characters that have kept the wheels of entertainment spinning. Coupled with baby boomers' need to rapidly adapt their ways in order to keep up with technology's boom – some could say life is insane! Robina and Lorenzo Wolfson certainly think so, and are now showcasing the lives of them and their peers in a fascinating new book. 'Boomers Eat Cake' provides an upbeat look at past and modern life, as it has been grappled with by the world's single biggest demographic. Boomers Eat Cake is a mix of humor, nostalgia and reality. The book also takes a great look at the sports world in the earliest boomer decades (1950-1970's) It does the same for music, entertainment and current times (especially the quirky and berserk). It provides a laugh out loud ride about people and places we enjoyed and the total insanity that we deal with on a daily basis. "We wanted to show just what baby boomers have lived through, and how the world of sports and entertainment have evolved as our wrinkles now set in," explains Robina Wolfson, who met Lorenzo at New Rochelle High School in New York. "As we all continue to live the boomer life and adjust to retirement, it's vital that we reflect on our past and acknowledge just how insane life has been!" Continuing, "The book strikes a nerve dealing with High School memories, Rock n 'Roll, Woodstock and more while still including the crazy world of social media, the internet and reality TV. If you want a periscope into the past that also juggles the challenges of the present – here it is!" Readers agree, leaving a slew of positive reviews. Wesley Eisenhandler comments, "I received an early release copy. I can't stop telling my friends how funny this book was. I couldn't put it down. I actually ready it twice and it was better the second time..."
Steven P. Mark adds, "This book is a funny and delightful read. For those who would understand the references and appreciate the nostalgia this is a must read." 'Boomers Eat Cake' is available now: http://amzn.to/1I6VSBN. The next best thing to knowing the Wolfsons is reading "Boomers Eat Cake."